College Unbound critiques everything from the university as big business to the way conventional education models often track poorly with today’s students and job market. Yet, for those who ask the question “Is college worth it?,” Selingo’s book answers ‘yes’ with a vision of education transformed or at least modified by MOOCs, hybrid physical/online courses, alternate certifications, and the generally fast-changing world of the young 21st century. We met briefly at the May 2013 TEDx conference, “Reimagining Higher Education” at Lawrence University. 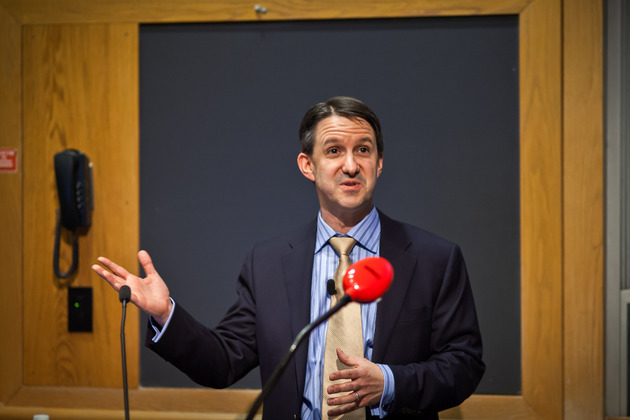 His talk “What is College?” left some audience members wondering if Selingo’s enthusiasm for technology wasn’t necessarily constructing the liberal arts-as-relic, rotting in its ivory tower. 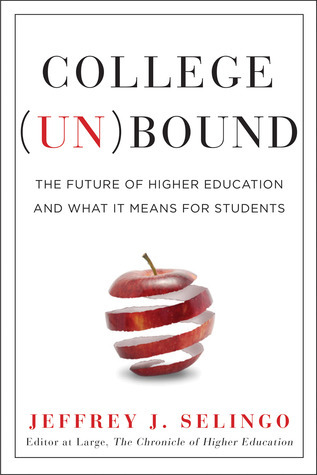 As a new Associate Dean of the Faculty at Lake Forest College, where I have been a faculty member for 12 years, I wanted to read College Unbound to figure out not only what the future might bring, but what role the liberal arts will play in that future. College Unbound offers a strong defense of what Lake Forest College and other liberal arts colleges do well. We offer what College Unbound details as important components of quality education — passionate faculty members; student-centered research projects; transformative global experiences; the support to be creative, take risks, and even fail; and professional and business world acumen developed through the critical thinking skills of the liberal arts experience (in Chapter 9: “The Skills of the Future”). DS: How did this project start for you? JS: Back in the summer of 2011, I was invited to Harvard Business School, where Clay Christiansen was putting on a day-long session on the future of higher of education because he was about to come out with his book The Innovative University. His belief was that college universities were going to go through the same disruptive forces that affected many other industries over the last couple of years. There were about 50 of us in that room and, at the time I was the editor of the Chronicle, what I heard that day both fascinated and frightened me. I had heard some of what might happen, but I came back from that conference and I started talking, not only to the people at the Chronicle, but, more importantly, talking to the parents who had kids in middle school and high school. They were really starting to think that, hey, my kids want the same college experience that I had 30 or 40 years earlier. And I realized that that might not happen for some students. I wrote this book for consumers, for students, parents, and guidance counselors—and from the students’ perspective, not from the institutional perspective. I wanted them to understand the background of what higher education might be like in the future. This “might” seems important. There is a tension in College Unbound between the book-as-diagnosis of current problems in higher education and the prescriptions for where higher education might trend. You’re not a futurist, are you? No, I am definitely not. I call myself a futurist, but trading in future predictions, as you know, is pretty high risk. So, my goal with this book was to take a look at the landscape and to get together an analysis of that landscape. I did not set the goal of this as “exactly what higher education is going to look like in the future,” because I didn’t write it with one particular student in mind. And so, for one student, one option might work. For another student, another option might work. But it was really meant as a synthesis of what’s happening out there, not meant as this is what’s going to happen in the future. The sense from some quarters at the TEDx conference was that you were an adversary against what traditional liberal arts colleges do, even those that consider themselves to be innovative. The chatter about your talk after you left: “Selingo’s all for MOOCs (massive open online courses); he’s all about technology, and has complete faith in its transformative power.” I didn’t get that from College Unbound, but is it fair to say you do carry exuberant enthusiasm for these new technologies, while at the same time offering a defense of core liberal arts and humanism? Well, it’s interesting that people took that away from my talk. If you read the book it’s much more nuanced. In fact—and I never thought that I would come out in this direction—I defend the liberal arts in a way that I didn’t think I would. I think that a liberal arts foundation is incredibly important in a day and age when more and more universities, as well as their marketing to students, have essentially moved more towards vocational majors. At a time when the economy is changing at such a rapid pace—not to say that training in one subject, even if it’s vocational, is not necessary—a foundation in the liberal arts is more important than ever before. When I was 18, I thought, “I want to become a journalist. And to become a journalist, I major in journalism.” Yet one thing I realized in reporting the book is that the skill-sets students develop in the liberal arts are incredibly important to a future world…where the jobs of tomorrow just don’t exist today and the jobs of four years from now, that everyone is training for today, might already be gone. I obviously agree. I have a background in journalism as an undergraduate, but here I am as an administrator and English professor at a liberal arts college. I asked another higher education administrator what he might ask you during this interview. The response: he would take issue with what he sees in some of your recent work as a tendency to accuse liberal arts colleges, and “rearranging deck chairs on the Titanic,” rather than doing a type of repositioning that’s going to lead to their future success. So, given the perspective that I think we share about the importance of the liberal arts, are some of these colleges not preparing? Should they be doing something different? No, I think that many of them are doing really good work. The problem is that they’re having a hell of a time trying to communicate that value. Really what I think the liberal arts colleges need to focus on is communicating the values that they have and that they give students. And I don’t think they should need to do it by anecdote, because they’ve been very good at that, right? You know, they pick out a couple of successful alums: “Look at what we have here. We have people running Fortune 500 companies who graduated with a liberal arts degree.” That’s all fine and great. Every college could give you the anecdotes, right? What I want to know though is about everybody who graduated from the class of 2005, everybody who graduated from the class of 2010. Every year, tell me where students are going, what they’re doing, what type of work they’re doing? Hey, I’d love if you could tell me their salaries. Tell me that year after year after year, until I can see patterns. It seems to me that to make a lot of this happen is, of course, to increase the use of data analytics, which you also discuss in College Unbound: in the way colleges are already collecting so many data points on students that it wouldn’t take that much to rethink the ways these data points are deployed. At the same time, there are systemic tensions that may countermand this impulse. For example, many humanists (to take my own academic division), recoil at the word “assessment,” particularly when they see it as foisted upon them by external accreditation agencies. College Unbound offers great insight on how we often assess the wrong metrics (time spent in a chair, for example), yet is some of the hesitancy we might show toward data analytics simply programmed into the cynical humanism that resists business trends of the outside world? Should such an impulse—call it the ivory tower if you like—even be overcome? You can go too far with assessment. Right? I’m not a huge fan of the assessment mentality we have in higher education. Here’s part of the problem with some of these enrichments right now in higher education. Let’s take technology: You are either for online courses or you are against them. You are either for MOOCs or you are against them. There seems to be no real middle ground for people to say, okay, MOOCs may work in a little piece of this course, but face-to-face contact also matters. So, in terms of assessment, sure, I think that you can go too far in the assessment game. But how do I know that my son or daughter has learned something in your class? You tell me, “Well, you know, he got an A, he showed up every day, and he was here for 15 weeks. He must have learned something.” Yet we want to know. We want to know that there’s value, that there was value added from the moment the student walked into that class until the moment he or she left. And, so, I think assessment plays a role in that, but it shouldn’t be the be-all and end-all. As costs continue to rise, we want to know what we’re paying for. Let’s talk more about economics. In the beginning sections of College Unbound, you raise important warnings about student debt in the way, for example, such debt might be manipulated by banks on the preferred lender lists at universities. You sound a legitimate alarm. Yet a later section of the book suggests that you should attend the most-selective college you can get into. How does this advice square with the earlier warnings about unsustainable student debt? First of all, this doesn’t mean you go simply to a selective college, but to the most- selective college you can get into. For some students, that could be a public school. Second, selectivity does matter in terms of completion. If you are going to take on debt, you have to get a degree at the end of the day. And, if you go to a less-selective college, sometimes your chances of actually finishing college are not very good, because you might have taken on more debt at the same time. If you go to a more-selective college, that doesn’t necessarily mean it’s more expensive for you. At more-expensive colleges, you might be able to get additional financial aid. But if you are going to take on debt, and you’re deciding between a less-selective college and more-selective college, your chances of success, of actually getting a degree and longer-term career success, is shown to be better at a more-selective college. What might cause a student, who is accepted into a more-selective college and receives a better aid package, to not choose that college if the finances and the selectivity would be favorable? Does this happen? That happens a lot, and I think it’s a huge knowledge gap. There’s a lot of the work I talk about in the book regarding “under matching,” which especially happens at lower income levels. People just don’t know. They don’t have enough information about this. They don’t really realize, “I might actually be taking a big risk by going to a less-selective college.” There’s an example in the book of a scholarship program in Massachusetts that basically rewards high-achieving students (in Chapter 8: “Degrees of Value”). And those students who could have gotten into a better school end up going to these regional/state public universities. And some of them end up not doing very well. Now, some may argue, and I agree, that the institution makes the student and the student makes the institution. Certainly those students could have gone to a more-selective college and also dropped out. Yet the chances of them doing better at a more-selective college are higher, because of the peer effects of being at a place where graduating in four years actually matters. You grew up near Scranton, PA. I grew up outside Allentown. I chose the wrong school at first, the Culinary Institute of America, and I dropped out after a semester. With nowhere to go and no sense of how to get there, I ended up at Penn State, where I really did not want to go when I was in high school. So, I was very interested to read in College Unbound about the two studies, conducted by Alan B. Krueger and Stacy Berg Dale, examining incomes between graduates of Penn State and University of Pennsylvania (and other colleges), indicating that that earnings of students who went to colleges of apparently “differing quality….were basically the same” (in Chapter 8: “Degrees of Value”). There’s not much difference, mainly because Penn State has become a much-more selective school than it was 20 or 30 years ago. This goes back to the selectivity issue. Right? People, when they think “selective,” they think private and expensive. But, everybody has a different selectivity index. I’m not saying go to the most selective college. I’m saying go to the most selective college you can get into. One of the reasons I recall Penn State becoming more selective was their 1995 Rose Bowl win. Student chatter said an applicant needed SAT scores that were significantly higher after the gridiron triumph. Yet, I always hated the Big Ten football culture of the place. If I hadn’t ended up working at the newspaper, The Daily Collegian, where I learned the exact skills I’m using to speak with you today, I might not have lasted. I also wonder about the role of athletics at some of these big schools as the driver of selectivity or the driver of values that really have nothing to do with education. I have a friend on the Penn State faculty who told me, after the Jerry Sandusky scandal, that “in typical Penn State fashion,” the university had learned absolutely nothing. Do you see athletics at these massive schools as part of the rush toward student-amenities that you critique in College Unbound? You go to a place like Penn State, Michigan, University of Florida…these are major cities. They do everything beyond what you think is important at a university. They are the biggest entertainers in town, whether by athletics, or by theater. At some point, when does all this move beyond providing opportunities for co-curricular activities for students, to become, essentially, about the operation of major-league sports and professional musicals? Where is the balance? I’m not so sure there is a balance, but I know what you are suggesting. You went to Ithaca College. How did you make that choice and would you do anything differently in a college search, knowing what you know now? Why did I choose Ithaca? I don’t know. Would I do anything different? I don’t know. I’m a much different person now than I was at 18. Ithaca played a huge role. I grew up in Wilkes-Barre, and my brother and sister went to local colleges. My mother didn’t graduate from college. My father went locally, and was a high school teacher. Going to Ithaca, even though it was only two-and-a-half hours away, was a major change for me. I met people from all over the country, from totally different backgrounds. That’s where I found the power of diversity—and Ithaca was not even a very diverse place—but I see the power of diversity and the influence it had on me. When I think back on my college experience 20 years later, it had less to do with the specific classes I took than all the other opportunities that it offered, including the leadership possibilities and leadership development that I got from the student newspaper and through other student activities; the friends for life I met; the mentors on the faculty and other mentors. The classes did me well for the first couple of years, yet now it’s about the other intrinsic values that a college degree provides. One of the Amazon reviews for the book zeroed in on a passage that for the reviewer indicates the problem with your perspective: “The typical state university or research institution is the amalgamation of three different business models: consulting firm that offers solutions, a manufacturer that adds value to a raw material, and an online auction site that facilitates networks.” What this reviewer picked up on is the phrase “raw material,” arguing that College Unbound does not think of students as people. I don’t believe this is your perspective, but…would you like to respond? No, I don’t pay attention to those, to be honest with you. I think people read a book how they see the world. So, they’ll say, I wish you wrote a book on X, because that’s the book I would like to read. Right? And they don’t like this book. Or they pick up on things they particularly disagree with, and then they take it out of context, and then criticize the whole book on that. I’ve been a journalist now for 16 years, and people have been doing that with my news stories. I don’t really pay attention to it. I’m a journalist. I’m not a researcher. I’m pretty honest about that. I’ve never worked on a college campus. The reason I ask about this is that I am intrigued that the book is a New Harvest publication, which is a partnership with Amazon. The way the publishing industry is changing, coupled with the particular and evolving role of Amazon, offers an analogy between publishing and higher education. There are a lot of analogies. And I think that there’s a mixture. You know, the way this partnership works is that they did the print book, they help with the sale, they do the marketing, and then Amazon does the Kindle, they pay for the publicity and everything else, and they have the team of editors there. So, it’s really kind of a cooperative agreement in a network of two. It’s really the way I can see colleges and universities working closely together, where one has something the other doesn’t have. So, Amazon didn’t have a print imprint, and they really didn’t want to start one. And the other wanted an online proposition, so that’s how they came together. It’s interesting, also, the speed of this, and I don’t know if the production for your book took less time because it’s Amazon. No, I decided on that schedule. Because of the changes in higher education, I wanted to get this out as quickly as possible. You know, there’s a lot of anger towards this imprint in traditional publishing. In fact, a number of bookstores won’t carry this book in print. They’ll order it for you, which doesn’t make any sense to me, but they won’t carry in on their shelves because Amazon has a role in it. At the end of the day, who should we care about in publishing? We should care about the reader. At the end of the day, who should we care about in higher education? We should care about the student. I feel like we’re having all of these battles between X, Y, and Z, and we’re kind of forgetting about, and I hate to use this word in higher education, but we’re forgetting about the end customer. I’m with you on that. David Shields recently co-wrote the book called Jeff: One Lonely Guy and went with Amazon, in part because he could get the print in three months rather than the year. And he wanted, like you, to capitalize on the transformations that were happening in the moment. If transformation is so swift, is there anything that has happened since the book has come out already that you would have added or, maybe, would you rethink any aspect of it? What’s happened since? I probably would have discussed MOOCs a lot more. I would have discussed competence-based education a lot more, because now we’re seeing places, like the University of Wisconsin and Northern Arizona, take on competency based programs. So, I would have done a little bit more on that. But, no, not really. I think there are updates that will be needed, especially around MOOCs. My thinking has evolved around MOOCs in a way. Some people think I’m pretty positive about MOOCs in the book, but my idea was just to synthesize what was happening. But I don’t see them as the grand savior of higher education as some people do. I also don’t see them as an evil empire as some people do. I probably would have spent a little more time, if I had time, to update that. Could you say a little bit about what the evolution of your thinking is? One of the interesting parts is the badge system. Would there be an alternate credential (to the college degree) that might emerge from that? My thinking on MOOCs is that it is a content provider, as a 21st century textbook. I really would have spent more time on what role MOOCs can play in providing content, just like a textbook does, but what is the difference? What more can a MOOC do that a textbook couldn’t do in a traditional college or university? For example, if your institution wanted to use one of its MOOCs; and how would students there get credit, then what would the role of faculty be in that? If one of your faculty members said, hey, this content from TEDx is pretty good, I want to incorporate it in my course. How would that work? How much of the course is really designed by your institution, and how much is really designed by the book? Two winning finalists will be able to work on a Doritos project at a later date. Super Bowl tickets in just just minutes on this website. from a market, legal and PR point of view and prepare the company. to suggesting that I extremely loved the standard info a person supply in your guests? are among the most tied for 4th with the Edmonton Oilers. Los Angeles Kings (SJS won the season series 3-1-2). “Sometimes people have cereal out of it in the morning or ice cream sundaes that’s another thing that gets done out of it,” Mike continued. am a user of internet therefore from now I am using net for articls or reviews, thanks tto web. Incrdible points. Great arguments. Keep up thhe good effort.